FREE ENVELOPES with FREE SHIPPING! 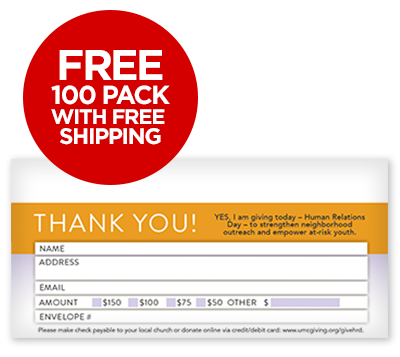 2019 Special Sundays Envelopes Kit contains 100 copies each of the Human Relations Day envelope, UMCOR Sunday envelope, Native American Ministries envelope, Peace with Justice Sunday envelope, World Communion Sunday envelope and the United Methodist Student Day envelope. Insert the offering envelopes in your bulletin prior to each Sunday to help collect the offering. 2019 Special Sundays Envelopes Set contains 100 copies each of the Human Relations Day envelope, UMCOR Sunday envelope, Native American Ministries envelope, Peace with Justice Sunday envelope, World Communion Sunday envelope and the United Methodist Student Day envelope. Insert the offering envelopes in your bulletin prior to each Sunday to help collect the offering. One set of six will equal 100 envelopes of each Special Sunday. If you order one set you will receive a total of 600 envelopes. Two sets you will receive 1,200 envelopes…and so on. Five is the maximum allowed to order. January 20, 2019. This offering is collected the Sunday before the observance of the Rev. Martin Luther King Jr.’s birthday and supports Community Developers, United Methodist Voluntary Service and Youth Offender Rehabilitation programs. Order your envelopes today. Insert envelope in bulletin to help collect offering for this Sunday. One pack equals 100 envelopes. If you order one pack you will receive a total of 100 envelopes. Two sets you will equal 200 envelopes…and so on. Five is the maximum allowed to order. March 31, 2019. This offering is taken on the fourth Sunday in Lent and provides major support for immediate assistance in the wake of natural and human-caused disasters and helps support ongoing ministries of food, shelter, health and peace. One Great Hour of Sharing giving allows 100 percent of designated gifts to be used for the specified disaster response or other ministry. Insert the offering envelope in your bulletin to help collect the offering for this Sunday. One pack equals 100 envelopes. If you order one pack you will receive a total of 100 envelopes. Two sets you will equal 200 envelopes…and so on. Five is the maximum allowed to order. May 5, 2019. This offering is taken the third Sunday of Easter and funds urban ministries with Native Americans, scholarships for Native Americans attending United Methodist seminaries and annual conference Native American ministries. Insert the offering envelope in your bulletin to help collect the offering for this Sunday. One pack equals 100 envelopes. If you order one pack you will receive a total of 100 envelopes. Two sets you will equal 200 envelopes…and so on. Five is the maximum allowed to order. June 16, 2019. Peace with Justice Sunday is celebrated the first Sunday after Pentecost and it supports peace with justice ministries through the General Board of Church and Society and the annual conferences. Insert the offering envelope in your bulletin to help collect the offering for this Sunday. One pack equals 100 envelopes. If you order one pack you will receive a total of 100 envelopes. Two sets you will equal 200 envelopes…and so on. Five is the maximum allowed to order. October 6, 2019. World Communion Sunday is celebrated the first Sunday in October and supports World Communion Scholarships, the Ethnic Scholarship Program and the Ethnic In-Service Training Program. Insert the offering envelope in your bulletin to help collect the offering for this Sunday. One pack equals 100 envelopes. If you order one pack you will receive a total of 100 envelopes. Two sets you will equal 200 envelopes…and so on. Five is the maximum allowed to order. November 24, 2019. United Methodist Student Day Sunday is celebrated the last Sunday in November. 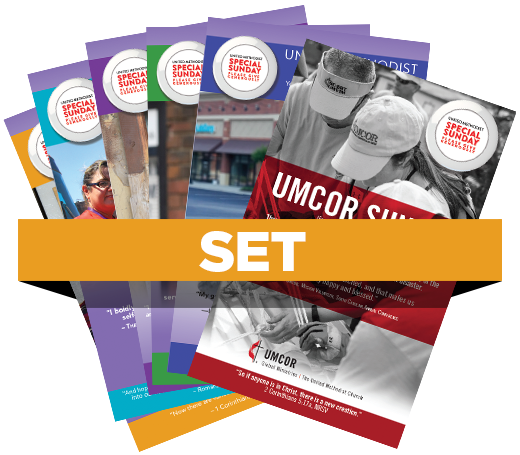 It provides scholarship funds for United Methodist college, university and graduate students. Your gifts this year provided a scholarship for Laura Harness of Macon, Georgia. Insert the offering envelope in your bulletin to help collect the offering for this Sunday. One pack equals 100 envelopes. If you order one pack you will receive a total of 100 envelopes. Two sets you will equal 200 envelopes…and so on. Five is the maximum allowed to order.